Portland based charcuterie-wizard Elias Cairo and his team use old-world techniques when making their classic pork rillettes. Locally sourced pork shoulder is butchered and simmered in lard with white wine, thyme, warm baking spices, and fresh ginger. When the meat is fall-apart tender, it’s cooled and hand chopped. The result is toothsome and rustic with a bold piquant flavor. 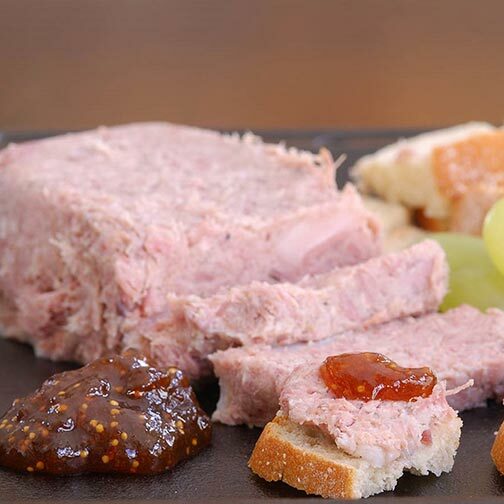 Thinking of making your own rillettes in-house? Taste this first—trust us. Ingredients: Pork, lard (pork fat, citric acid, BHT), white wine. Contains 2% or less of sodium nitrite, salt, fresh garlic, fresh ginger, fresh thyme, spices.